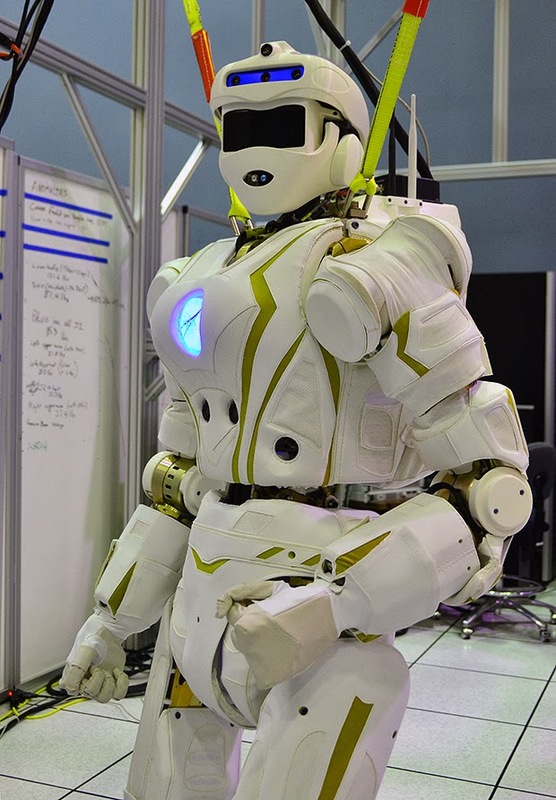 NASA’s Johnson Space Center (JSC) has finally unveiled Valkyrie, its “superhero robot” entry to the DARPA Robotics Challenge (DRC) Trials, which take place on December 20 in Florida. 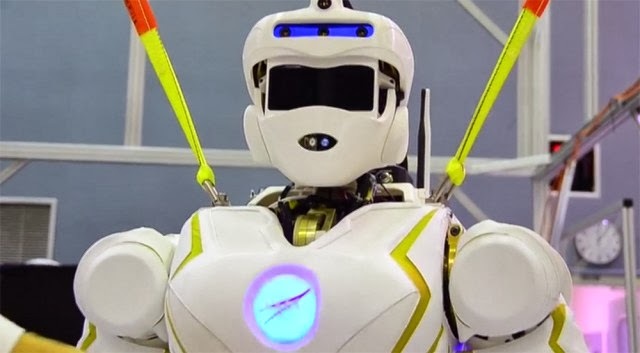 Valkyrie will compete against fellow humanoid robots, such as Atlas, on a series of eight physical tasks to test the dexterity and autonomy of the robots, with the chance of going forward to the DRC Finals in 2014, where it could win $2 million from the US government. The DRC isn’t about money, though: It’s all about accelerating humanity’s development of advanced humanoid robots, for use in hazardous situations such as war. Valkyrie, so named after the supernatural female figures in Norse mythology that plucked fallen warriors from the field of battle and transported them to Valhalla for an eternity of feasting and mead quaffing, is 1.9 meters tall (6’2) and weighs 125 kilos (275 lbs). Valkyrie, or Val for short, has 44 degrees of freedom (divided up between her legs, feet, arms, hands, torso, and head) and is capable of walking over uneven terrain, driving a vehicle, and using tools. 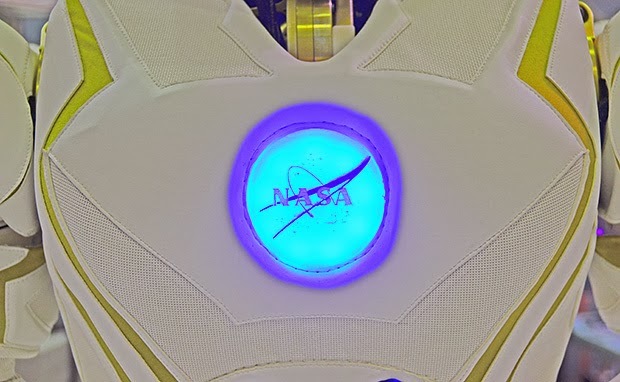 Oh, and yes, that is a glowing NASA logo emblazoned on her chest a la Iron Man. Valkyrie. Image (and other images on this page) are courtesy of IEEE Spectrum. To begin with, most of the robots taking part in the DRC including Valkyrie will be remotely operated. The robots will still feature a large amount of task-level autonomy the operator will instruct the robot to “grasp the tool” rather than “open hand, rotate 90 degrees, extend hand, close hand,” and the robots will have built-in collision avoidance but we’re not talking about robots that can walk around and automatically pluck survivors from the wreck of a fallen building. We’re also not talking about robots that can engage in squad-based military maneuvers. That step comes next. That isn’t to say that Valkyrie isn’t equipped to be fully autonomous, though. Val is outfitted with more sensors than you can ever imagine: cameras and LIDAR in the head, cameras and sonar in the chest, and cameras in the feet, knees, and forearms. These sensors are primary data sources for Valkyrie’s automation routines, but the operator can also take a look at a camera feed to get a closer look at obstacles, what’s being grasped by Val’s hand, etc. One of the more unique aspects of Valkyrie except for her female name; most utility robots, including those competing in the DRC Trials, usually have male or genderless names is the fact that she’s wearing clothes. If you take a look at every other robot competing in the Trials, you’ll notice that they’re mostly riveted metal plates and steel tubing. NASA takes softness very seriously, it seems. ”Our robot is soft. If you brush against it while you’re working, you don’t want to feel this cold, hard metal. You want it to feel natural, like you’re working next to another human being,” NASA’s Nicolaus Radford tells IEEE Spectrum. 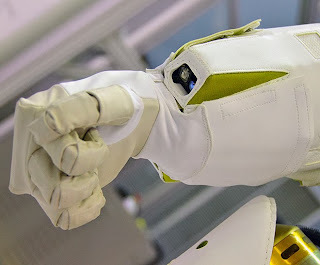 It’s not easy to cover a robot in clothing (think about how much your skin stretches and contorts while you move), and so NASA’s JSC had to develop its own clothing lab, to create Valkyrie’s clothing on-site. NASA might seem like an odd institution to be developing a humanoid robot, but it all makes a lot more sense if you factor Mars into the equation. “NASA wants to get to Mars, and in order to get to Mars, NASA will likely send robots ahead of the human explorers,” Radford says. ”These robots will start preparing the way for the humans, and when the humans arrive, the robots and the humans will work together.” NASA has a strong background in robotics, too don’t forget that Curiosity and Robonaut are two of the most advanced and precocious robots in existence. DARPA’s Robotics Challenge is mostly focused on creating robots that can replace humans in hazardous situations chemical spills, burning buildings, warfare and traversing Mars, which doesn’t have an atmosphere, is pretty darn hazardous.